Until he unleashed a fiery postgame rant late in his coaching career, Dennis Green wasn’t known as one of the most intense competitors in NFL history. But Warren Moon could have told you that no one wanted to win more than Green. A meticulous planner whose work ethic was second to none, Green, who died Friday of cardiac arrest at 67, set the tone for everyone who reported to him. And if Green sensed that assistant coaches or players weren’t striving as hard as he was, he didn’t have to open his mouth to send a message. “If we had a bad practice, or especially if we lost a game, Denny would stand by the front door of our meeting room,” said Moon, the Hall of Famer who started at quarterback under Green for three seasons with the Minnesota Vikings. 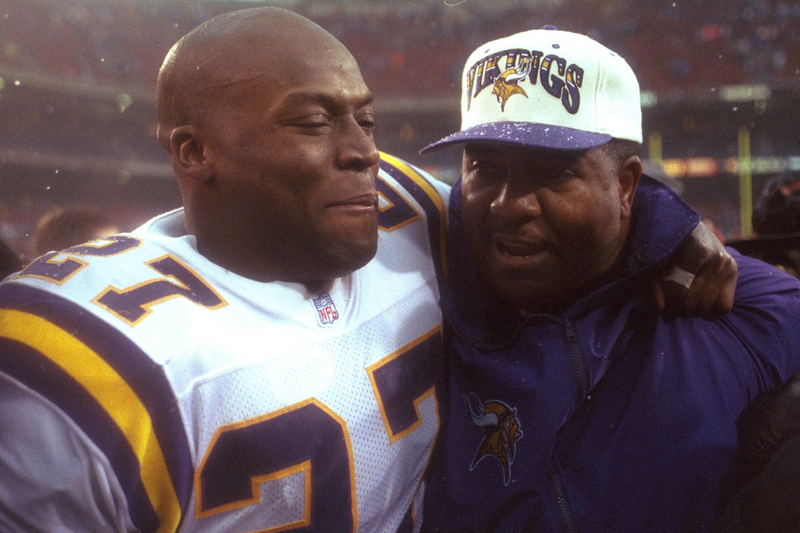 Only the second African-American head coach in the NFL’s modern era, Green took charge of the Minnesota Vikings before the 1992 season. At the time, Art Shell, who took over the Oakland Raiders during the 1989 season, was the league’s only other black head coach. Green had proven himself as a college coach at Northwestern and Stanford, and in the pros as a member of head coach Bill Walsh’s San Francisco 49ers staff. Like Shell, Green was a pioneer at a time when the NFL only embraced inclusion on the field. The Rooney Rule, which requires NFL teams to interview at least one ethnic minority candidate for job openings, wouldn’t be implemented for another 11 years. If Green failed, it would be harder for other African-Americans to ascend to the highest positions in coaching. No matter how you measure it, he got the job done. In the 1990s, only five coaches had more wins than Green’s 81 victories. Among Vikings head coaches, Green is second only to Hall of Famer Bud Grant with 159 games coached, 97 wins and a .610 winning percentage. During his 10 seasons with the Vikings, they had eight playoff appearances. Green had his best team in 1998. It was Randy Moss’ rookie season and the Vikings went 15-1 and set an NFL record for points in a season. Although the Atlanta Falcons upset them in the NFC championship game, that season established Green as a coach who could build and sustain a program. “He showed what we could do as coaches if we got the opportunity,” said Doug Williams, the first black starting quarterback to win a Super Bowl (with the Washington Redskins). “And Denny understood that getting the opportunity and doing something with it was all part of something bigger. Tony Dungy, who served as a Vikings defensive coordinator under Green, was the first black coach to win a Super Bowl. On Aug. 6, Dungy will be inducted into the Pro Football Hall of Fame in Canton, Ohio. Green took pride in the achievements of everyone who coached and played under him. “He was tough, and he didn’t take crap off of anyone, but we were all family to him,” Moon said. “Guys who didn’t know each other well, he would encourage them to go eat together in the cafeteria. And he took care of us. Denny provided great meals for us. We had a full-time cooking staff. If there was something that could keep us fresh and ready [to play], Denny would think of it. Green’s second act didn’t work as well. As head coach of the Arizona Cardinals, Green suffered three consecutive double-digit loss seasons. His stint in Arizona, however, did produce one of the most memorable sound bites in sports history. But for African-Americans who have played and coached in the NFL, Green will be remembered for much more than losing his cool that one night in the desert. “Everybody knows about the rant and goes back to that, but not enough people remember him being a successful head coach at a time when there was no Rooney Rule,” said Ryan Clark, who played safety for 13 years in the NFL and is an ESPN analyst. Green was a pioneer. And that’s definitely something worth shouting about.